Our AB series of optimized ripsaw/edger infeed allows you to automatically measure, position and feed material into one of our ripsaws or edgers. By precisely measuring and optimizing the cutting result and blade position based on your cutting list we can greatly increase your lumber yield and reduce labor costs. 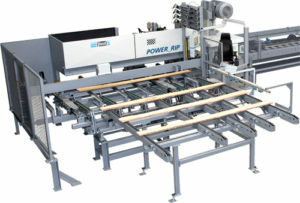 Paul can offer infeed and outfeed handling equipment to minimize your labor when feeding one of their wide arbor panel ripsaws. 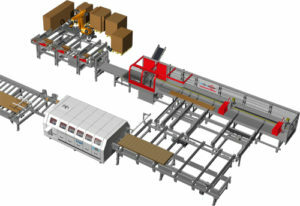 Automatic feeding from a stack and then automatically stacking the finished pieces allows most of the labor involvement to be accomplished by your fork lift driver that is delivering material to be processed to the line and then removing the finished pieces from the line.